Founded in China. Zi Wei Dou Shu is one of the oldest known astrologies in human civilisation. Also literally known as "Purple Star Astrology" to some, Zi Wei is believed to be founded by a Taoist, Chen Xi Yi. Zi Wei was once palace-bound spanning across a few dynasties for many centuries. Emperors consulted Zi Wei Dou Shu for important decisions such as warfare and administration. In those times, advisors and servants in palace literally traded in their lives as collaterals for their work reputation and achievement. Spontaneous public beheading was a common sight for failure to meet emperor's expectation. Of course, this does not suggest the existence of any documented record for account that involved the killing of Zi Wei Dou Shu advisor but clearly, Zi Wei has survived through the harsh tests of time in the palace. Putting Ziwei alongside many other ancient human inventions, not many have come through and still continues to exist today. Zi Wei has undergone many eras of evolution before it comes to its present-day form. These changes, are necessary to adapt and to be inline with the environment's dynamic. Just like any other scholarly disciplines, there are two main streams of Zi Wei Dou Shu, namely Northern and Southern schools (Sihua Flying Stars and San He). The Chinese legend has it that the birth of Zi Wei Dou Shu was a lucky discovery of a tortoise that had some unusual markings on its shell. These markings inspired the founder who translated them into Chinese arts of prediction and later Zi Wei Charts that being used over a few thousand years, until today. There are also other theories that claim Zi Wei Dou Shu was a result of a long evolution from other Chinese astrological systems. No one knows. At least there is not a single published Journal reporting about Zi Wei Dou Shu. Sadly, not many known methodical research has been performed into tracing the origin and the evolutionary path of Zi Wei Dou Shu. This creates a gap for many practitioners attempting to educate public with the false knowledge that they developed themselves based on hearsay. This is more evident with the advent of website technology today. This is indeed a shame. It is a world heritage that should be given due recognition. It is also an art that seperates the fundamental thinking of West and East on how human came into being. It is also a doctrine that challenges us to rethink again... "Can we predict our future?". Alternatively, can Ziwei be a science of a collective statistic? Very much like a statistical analysis in medical research, whereby patterns of behaviour collected over a large sample over a long period of time to establish a future predictable behaviour pattern? If so, this will boil down to two findings i.e. First, past behavior of one person is a predictor for the future behavior of another; Second, "We all can well predict our futures!". Let's not overly concerned on the debate for how Zi Wei Dou Shu planted its root. One thing for sure, it lives by its name. It has gained worldwide reputation for its practicality. 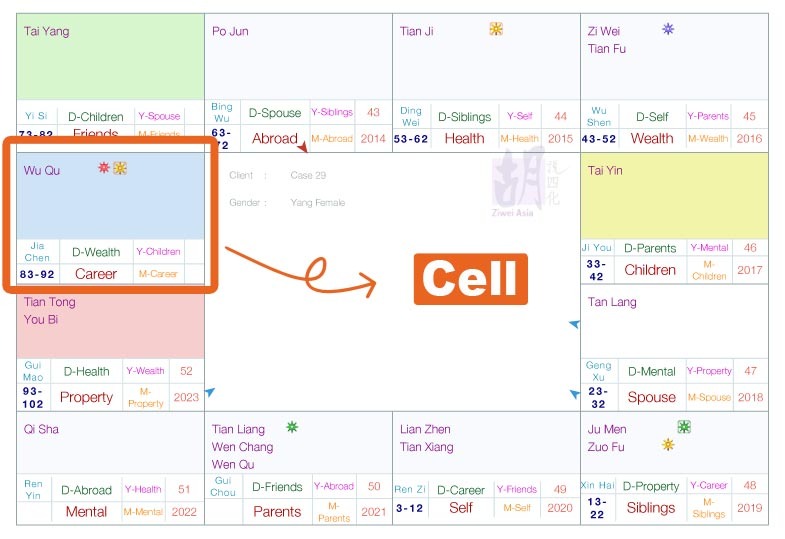 There are twelve cells in a Ziwei Chart, namely Self, Siblings, Spouse, Children, Wealth, Health, Abroad, Friends, Career, Property, Mental and Parents. Each of these cells tell a story by the name it suggests. Explore your free Ziwei Chart here. In Zi Wei Flying Stars school (紫微四化飞星), one's destiny can be dissected under different miscroscopic layers such as life dimension, decade, year, monthly, daily etc. At a more advanced level, each of these cells can even be transformed into another interpretation perspective such as Wealth becomes Spouse, Health becomes Office or Sibling becomes Mother etc. Unlike Divination, a Zi Wei Chart will never change regardless how many times you try plotting it as long as the same birth information is being used. It is personalized and assigned to you upon your drawing of first breath and follows you through to your last breath. It is your second birth document. It conceals unlimited destiny data. By learning the Zi Wei decoding art, you will be able to crack your future just like how a pilot drives a plane. Set the course. Go around the turbulence. Interestingly, some of our graduated students manage their destinies by ticking-off their future events as they happen. As they are privileged upfront with their futures, it has become their new hobbies by crossing off past futures as a new found way of managing their to-do lists.